Patrick Nathan, Vice President Corporate Information and Communications, SMRT, Singapore. Patrick Nathan heads Corporate Information and Communications, which includes the Corporate Marketing and Communications and Passenger Service Departments. He also leads the Information Fusion Centre which has been set up as a new capability to enhance information fusion and analysis within the organisation. He assumed this role in September 2013. 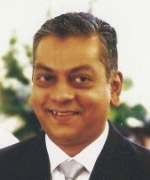 Mr Nathan joined SMRT in 2011 as Director, Security and Emergency Planning. In the two years with SMRT, Mr Nathan has provided a more strategic perspective to deal with issues concerning security and achieved desired operational outcomes, whilst safeguarding group-level financial considerations. Prior to SMRT, Mr Nathan, a former army officer, has over 25 years’ experience in diverse areas such as defence relations and security. He has served on the National Security Secretariat in 2002 and was also seconded to the National Security Coordination Centre, Prime Minister’s Office as its Deputy Director, a post he held until he joined SMRT. At the Centre, his primary duty was strategic policy development, including various responsibilities such as policy, risk assessment and corporate communication. He most notably contributed to and led the creation and development of the Risk Assessment and Horizon Scanning program between 2004 and 2011. Mr Nathan holds a Bachelor of Social Science (Honours) in Political Science from the National University of Singapore and a Master of Science in Strategic Studies from the Nanyang Technology University.